A firm aims at maximum revenue or sales consistent with earning minimum profit. This model is a compromised between total sales and profits. But it is also understood that after MR = MC, increase in sales can only be at the expense of profits. This puts a limit to sales increase because minimum profits must be made. 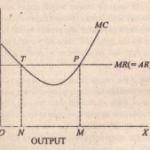 Here TR is total revenue, TC total cost and TP curve represents total profit. At the output OA, profits are maximum. But if the firm aims at only sales maximisation, output will be OC which corresponds to R2 at the top of TR giving maximum total revenue. Dut actually this firm will produce and sell 08 corresponding to R. total revenue because it gives minimum profit.